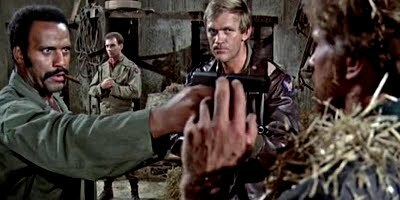 Having escaped a fate worse than The Dirty Dozen, WWII court martialled Bo Svenson, Fred “The Hammer” Williamson and typecast company find themselves caught up in a comedy of Nazi errors and are coerced into embarking on a deadly mission of sorts. very non-European referencing elsewhere, The Inglorious Bastards is nonetheless,in its own right, a decent enough spot of khaki clad fun. Steeped in his trademark penchant for slow motion photography and stylistic explosions of violence, the director throws in a vague, soppy, romantic sub plot and an exploitative, and pretty superficial, racial politic for good measure. Blink and you’ll miss ‘em spots from Castellari regulars Massimo Vanni and Josh Sinclair, and some fine set pieces towards the end which showcase the inventive model work of Gino De Rossi, only add to a brisk but purposeful approach which keeps Castellari’s film on the right side of the tracks of engagement.